The sons of the fourth sun corresponded to Chalchitlicue (Goddess of the Waters) Tonatiuh. This is represented by a chalice filled with water, which also serves as a frame to Chalchiutlicue, wife of Tlaloc (God of Rain). The fourth race is mentioned by the wise of many epochs, particularly because it was the race that preceded ours: the Atlanteans. They developed a very technologically advanced civilization, as they united science and transcendental mysticism and were able to reach achievements that are yet to be met by our present civilization. Geographically, they were located on the ocean that carries their name – the Atlantic Ocean. 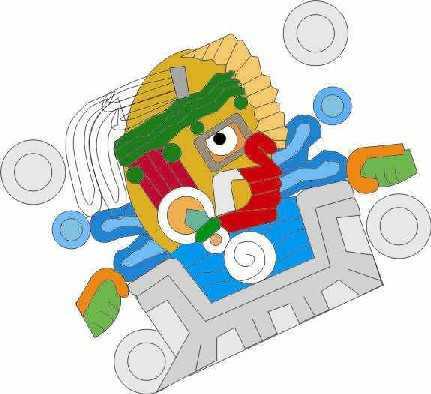 Inheritors of the Atlanteans are the Egyptians, the Mayans, the Incas, etc., with all their architectural similarities, religion and culture. This race truly degenerated; in their Age of Iron they stained themselves with psychological defects (anger, lust, pride, sloth, gluttony, envy, etc.) as they openly manifested their vices and departed from the heart of the heavens (that which is spiritual). The race was terminated through storms and rains that enveloped the earth, with waters reaching the peaks of the highest mountains. The sons and daughters for the Fourth Sun perished by the waters, they were transformed into fish, or to better say, they were devoured by the oceans. They were fish… as without the pure waters of life the regeneration of the Human Being becomes impossible. Those who followed the Wisdom of the Fish were saved, all others perished by the waters of the Great Flood. It is only through the path of self-knowledge that salvation is possible.